The Marist College Red Foxes Women’s Soccer Fall ID Clinic is on November 19 at the Tenney Stadium in Marist College campus. It is inviting all female soccer players from grades 9 to 12. It is a 1-day event that is ideal for excellent soccer players with a high interest in playing at the collegiate level. This clinic will be using the Marist College women’s soccer team’s training methods which makes them successful. In addition, it will provide the participants an opportunity to showcase their outstanding skills in from the college’s staff. There is a limit on spots available. Thus, registration is on a first come first serve basis. Marist College is a private coeducation college. Its location is in Poughkeepsie, New York. It is offering 40 undergraduate majors. It also offers 21 certificate programs. Currently, it accommodates around 6,500 undergraduate students. The college is 9th in the Regional Universities North ranking, edition of Best Colleges. Also, it is 248th in the Business Programs ranking. Marist College’s identity colors are red and white. It has 23 varsity teams. They are competing in the Metro Atlantic Athletic Conference of NCAA Div I. Their athletics nickname is the Red Foxes. It’s women’s soccer team has already 4 MAAC Championship appearances. The team is also the 2011 MAAC Tournament title holder. They are in 6th place in the latest conference standings. The Red Foxes coaching staff consists of Gene Smith, Leanne Benson, Aaron Suma, Briana Galeazzi, and Ali Kaptein. Head Coach Gene Smith is a GMAC Coach of the Year awardee. He has a Regular Season Championship title as West Virginia’s head coach in 2015. Then, Assistant Coach Leanne Benson is a USSF “D” License. She is also a former Eastern New York ODP Evaluator. Aaron Suma is the Red Foxes Head Strength and Conditioning Coach. Briana Galeazzi is the Athletic Trainer. Finally, Ali Kaptein is the Academic Advisor. 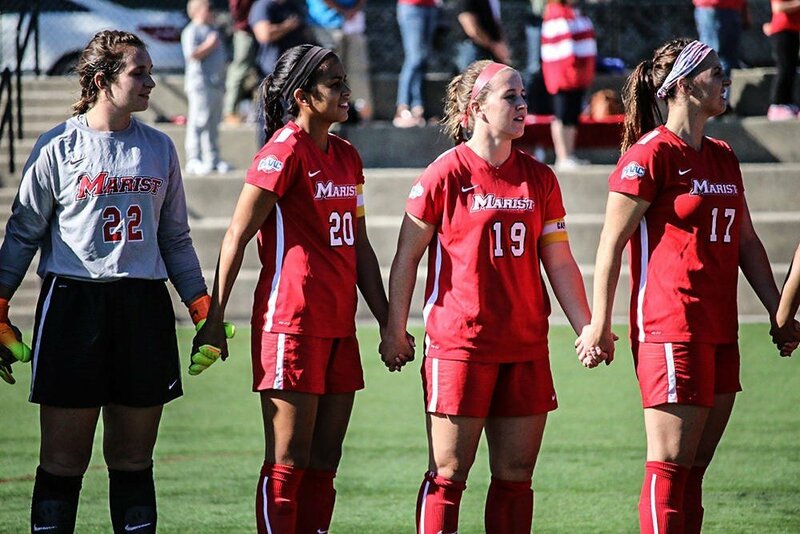 The Marist College Red Foxes Women's Soccer Fall ID Clinic will be using the Marist women's soccer team's training methods which makes them successful.